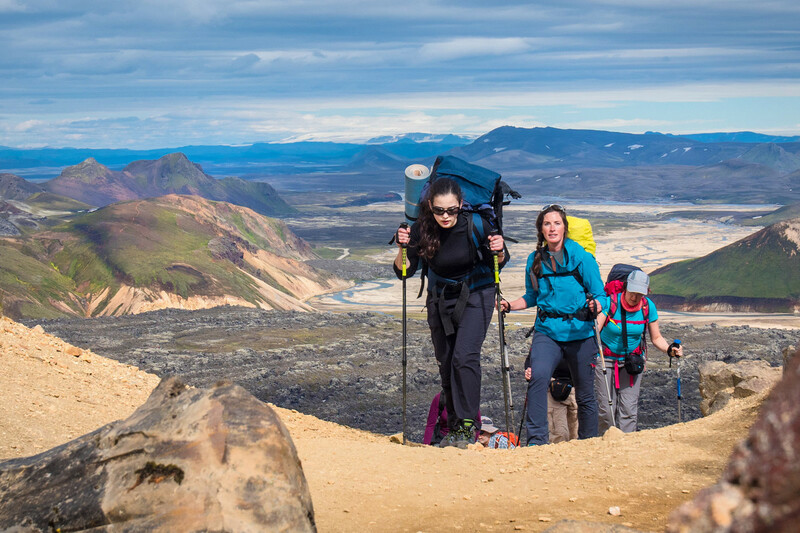 A light backpacking tour that will make you feel like a true explorer of the Icelandic highlands. Embark on a journey from Landmannalaugar to Þórsmörk that minimizes your material belongings and lets you experience nature to the max. With most of what you need strapped to your back, you will traverse through extraordinary landscapes. Your highly experienced and knowledgeable guide will lead you between vibrant rhyolite mountains, through black sand deserts, past majestic canyons and end in the green valley of Thor (Þórsmörk). After each day of trekking, you will spend the night in a cozy mountain hut, where delicious food, a cozy sleeping bag and a good night’s rest awaits. Enjoy the trail that National Geographic named as one of the 20 best treks in the world. A truly unique adventure for nature enthusiasts. 4 days trekking through the wild highlands carrying kit and food. This is not a tour that provides a snapshot of a special country, it completely immerses you in the wilderness around glaciated peaks. Each of the four days is different as the route first climbs to a snow covered peak through volcanic turmoil, then follows the ground downhill to within sight of the sea. Along the way there are fumaroles, glaciers, lava flows, ash deserts and verdant green lands before finishing in Thor's forest. The trek involves steep uphill sections, traversing snow fields, walking ridges, visiting steaming vents and boiling springs and river crossings (without the aid of bridges). This is made enjoyable by the quiet, confident leadership of a guide who manages all of the administration at the mountain huts, organises the cooking and cleaning, and supports the group by listening to our aspirations, adjusting pace and stops to match and directing through the landscape whilst teaching new outdoor skills. The accommodation is basic but adequate...My views on finishing this tour were that neither words nor photographs (and I have many) can convey the splendour of this tour. I can only summarise by saying that if you enjoy outdoor adventure and get the opportunity to do this tour - do it.